I assembled this creation to imaginatively showcase the new plastic “skins” from LEGO Forma, a LEGO-produced crowdfunded product that I pledged several months ago. As soon as received and unwrapped my myriad “skin packs,” I knew that I’d want to find special ways to integrate their unique, vibrant elements in designs of my own! The first Forma-based creation I built was this Bird of Paradise, which used the Splash Koi’s fins as its plumage. Read on to find out more about its design, as well as that of the rest of this diorama! This bird was a fun, relatively quick assembly. Its concept was pretty much immediate when I began futzing around with the Forma skins— after all, the serrated edges of the koi fins very naturally led to making a bird, as they looked like feathers. The bright colors of these printed plastic elements informed the rest of my color scheme; while I could have made an even more colorful bird by designing its brick-built body in a different color, I found that by following the cues of the wings and tail, I ended up with a more cohesive-looking creature. I quickly opted against using Forma’s default connectors to attach the wings. They looked out-of-place, being wholly white, and drew too much attention to themselves. Simple studs on top of 1L Technic pins was a much better integrated solution. I did face a bit of a challenge in figuring out the tessellation of the “feathers,” though. Since the koi only came with four lower fins, but I needed five pieces to give the bird a matching tail, I ended up using the original fish’s large dorsal fin as one wing tip. My task thereafter became masking the asymmetry of the outstretched wings. However, I also (as you can see) photographed the bird with its wings closed. The three images above each represent one of a few slightly different constructions of the Enormous Bird of Paradise. The first and second images share wing designs, but their shoulders are slightly different. Meanwhile, the third image and first image keep the same shoulders, but obviously utilize different wing designs. My favorite parts of the Enormous Bird of Paradise, aside from my use of the Forma skins, are the bird’s lower extremities. These use the tiny bar attachment of golden bucket handle elements as a joint between foot and leg, while the same brick simultaneously creates two more “toes” on each foot! Why, you might be wondering, is this the “Enormous” Bird of Paradise? After I built this bird, I debated photographing it solo (or maybe in a cage, or on a tree branch) to suggest that it was a normally-sized jungle bird. However, when I put it next to a minifigure or two, I ultimately decided to weave my new animal into a different, minifigure-scale scene; that choice just felt more fantastic and interesting to me. …And here they are! Prompted by LEGO’s classic action theme, Adventurers, my first idea was to build a team of explorers who might be discovering the Enormous Bird of Paradise. However, once I built a variant of that franchise’s villain, Lord Sinister—complete with huge top hat—I realized I could represent roughly the same time period as the Adventurers (actually, a little earlier; 1910s versus 1930s), but simultaneously represent and satirize a problematic practice of early 20th-century western civilization: imperialism. There’s a clear racial divide on display above. On the left, a trio of white, colonizing Englishmen. At right, a pair of their "civilized” Rhodesian (modern-day Zambian) servants. While the imperialists walk relatively unburdened through the jungle, their African entourage are laden with supplies and coerced into servility. In this scene, through these minifigures, I seek to present the imperialists’ hubris, greed, and callous disregard for nature’s and others’ liberty. From left to right, these are our characters. Baron Thaddeus Ipswitch, a callous capitalist. Baron Ipswitch, already born into great wealth, perpetually seeks to grow his enormous fortune. His hobbies include skirting workplace safety violations, underpaying workers, and monopolizing whenever possible. Baron Ipswitch believes the Enormous Bird of Paradise represents a tremendous financial opportunity for him, whether that be by its capture and exhibition, by the sale of its gigantic feathers, or by other, grislier practices. Mr. Uriah Raymond, a savage hunter. Driven by glory and love of weapons, Mr. Raymond brags to everyone he meets that he will be the only man to ever kill the mythical Enormous Bird of Paradise. Although hired by the Baron for this expedition as a guide and tracker, and having been given instructions to capture rather than kill the bird, Mr. Raymond will not hesitate to seize his moment and have his way. Mr. Horace Henry, a timorous naturalist. Mr. Henry has been an “armchair naturalist” for his whole career. He much prefers sitting at home in his study, poring over bones and fossils in peace and quiet, to venturing into the field. This is his first time in Rhodesia, his first time in the jungle, and he does not like it one bit. Mr. Henry is also a notable expounder of Social Darwinism. Naweji “Jack” Gama, a misanthropic valet. Mr. Gama, nicknamed “Jack” by his first master (and against his wishes), has served Englishmen nearly his whole life. Although his employers value his intelligence, aptitude for arithmetic, and levelheadedness, Mr. Gama is appreciated by them most for his servility and talent for keeping “this African mess” out of their lives. Needless to say, Mr. Gama privately holds the British in great contempt. Sonkwe “Sammy Boy” Onani, a disenfranchised menial. Mr. Onani has been recently conscripted into British service directly. The imperialists treat “Sammy Boy” like a pack horse, but he has no real avenues through which to raise a complaint, express himself, or ask for a raise. In about 50 years, Mr. Onani will become a proponent of Zambian independence. Thanks for reading! If you have any other questions or thoughts about this model, feel free to leave them in the comments below. While, like my retro and futuristic figbarfs, I designed this LEGO Minifigure arrangement for a contest, I think of this series more as a successor to my previous three series of fantasy minifigs. Like the characters you see in those, the motley assembly here comes from the world of Dragon Lands, a medieval fantasy “theme” of my own creation. As I continue work on a new “wave” of Dragon Lands “products” (official re-launch announcement coming later! ), sharing a few more characters felt like a good way to start building hype for myself and my fans. • Isbahn, an augmented blade-master. The arm Isbahn lost in his youth has only made him stronger— some advanced swordplay just isn’t possible with a human hand, after all! I bought Isbahn’s head, hair, and torso/legs combo all in one Bricklink order, intending to share the wealth of new elements among my collection of fantasy minifigs. However, as soon as I had experimentally clicked these bits together, I knew I had a great character on my hands and refused to share them anywhere else! The prosthetic blade-arm was a pretty late addition, enabled largely by me getting some of those new short-handled Ninjago katanas which fit perfectly in the forearm stump. I love how muted Isbahn’s color scheme is; it really gives off the “rugged adventurer” vibes I wanted. • Bruiz, a merciless executioner. Bruiz is unlikely to let convicts have any last words; he prefers to let his enormous axe do the talking. This character came together around that axe design. The wicked, curved blade screamed “executioner,” so I figured I’d ride that instinct and go for the classic, bare-chested-and-hooded stereotype. The big difference here, of course, is that I made Bruiz an ustokal (orc-like species in the Dragon Lands world). His torso bears a custom sticker I designed, modeled on a musculature pattern I stole from Jake Gylenhaal. • Kunaye, an ancient mage. Since the Dawn of Magic, Kunaye has been around to help impose some limits on its rampant energies… and, of course, on power-hungry wizards. Kunaye is my favorite fig of this series. She’s one of my favorite fantasy figs I’ve ever assembled. I think this is because of how perfectly and naturally all her parts complement each other, wrapping her up into a unified design. For instance, the skirt of the Sensei Wu robes goes great with a cape (and the skirt and cape are both made of the same fabric). The subsequent all-white outfit, combined with white hair, lends this character a sense of purity, age, and wisdom. I love how the hairpiece guided me to this lovely skin tone, and that one of the coolest heads in that rare skin tone comes with—how synchronously!—white patterning on its face. The white/nougat scheme gets reinforced a third time by a set of dual-molded white legs with nougat feet. The gradient into gold on her hairpiece (not visible from this angle) informs the use of the golden staff. All ties together. • Ynul, a hungry hatchling. He’s got a ravenous appetite— he’ll grow several feet longer every day if he’s fed properly— so you should probably keep your distance! I’ve had this mini-dragon design around for a while. It actually predates my micro Balrog and micro Fell Beast, even though those got published first. Making Ynul monochromatic felt like an obvious choice, because it helps sell this collection of bricks as a single being. Black was the way to go, since that’s one of the only colors I had these little wings in! I’m glad I opted to include fire coming from Ynul’s mouth, too, because I think that detail really gives him a sense of activity beyond “sitting there flapping his wings.” Adding some bones at the base of his perch helped link Ynul to Stish, who is feeding him. • Stish, a conniving merchant. Stish will do anything to squeeze another few coins out of life, whether it means selling watered-down wine or illegally importing, hatching, raising, and selling baby dragons. Finally, a good chance to use “teenage legs” from the Harry Potter collectible minifigs series! Mixing these legs with that Goblin torso from The Hobbit was the combo that led to the rest of the character. The body I’d crafted felt insidious, wicked, but not especially dangerous… shifty merchant? Bingo! I chose one of the most wrinkly-faced minifig heads I had on hand to match with Stish’s messy, gnarled torso; I imagine he’s suffered a lot of injury smuggling dangerous creatures. Adding the vibrant turban felt right, too, since I feel like it perfectly situates this character in a bazaar setting. • Waka Mhol, a brutish warrior. Waka’s vocabulary is limited to words like “me,” “you,” “happy,” “angry,” “club,” and “smack;” otherwise, he communicates using guttural growls and shrill whoops. Sam Flot and Waka Mhol were originally conceived as a duo, so when the time came to publish my last Dragon Lands figbarf, I felt a little sad to be splitting them up. I’m just happy now that Waka is getting his time to shine. I so love the disproportionate look of the Chima crocodile head on a short-legged body. My inroad to this figure was the silver jaw armor on its headpiece, the which I tied to the silvered breastplate piece. When I first designed this figure, I didn’t know what weapon would be appropriate for such a “regal,” silver-clad crocodilian warrior. The answer (almost literally) smacked me in the face, giving me a perfect tool to cast this character in a more comic light. And yes, the name-pun is intentional. Like my Retro Space Minifigures, I designed this minifig series (affectionately known as a “figbarf” among the fan community) for a contest. It seemed like a perfect time to debut these designs, the majority of which have waited almost-finished in my back pocket for about a year. The combo of sand-blue overalls with Hero Factory armor was one I really liked when I first made it, especially when I added dark brown hands to match with the straps on their legs. Who did I end up with? A squad of futuristic Earth Defenders! I’m not sure exactly what they’re defending against (Intergalactic invaders? Terror cells? Warring superpowers? ), but I do know that they hail from all over the globe, united in their mission to save our planet from a disastrous fate. I’m happy with the pose I achieved on Sgt. Nguyen; he was the hardest to balance for obvious reasons. The night-vision goggles and gunmetal grey racing helmet is a combination I’ve had around since the very first iteration of these minifigures; if not for variety’s sake, I probably would’ve given this headgear to more characters because I think it looks so good! Also notice how, very conveniently, the bar hole on the green power blade piece (seen more clearly on Pvt. Agustín) slots perfectly onto the back of the Hero Factory armor. Of this series of five characters, I find Pvt. Agustín the least interesting. He essentially just demonstrates the Earth Defender uniform and color scheme on a basic canvas—which I guess is valuable, to an extent—and lets me show off the power blade, a common weapon among this team, when drawn. I opted to use Asaaj Ventress lightsaber handles for these swords because I liked how sleek they look, plus they subtly extend the curve of the blade into a pleasing sine shape. This was the last of these minifigs to come together. To me, Cpt. Nielsen is what really ties this figbarf together and gives me a clear idea of who these uniformed people are. Plus, she gives a spot of visual interest with the brightness of her attire. I opted for a clean white uniform largely because the parts I wanted to use (pants with printed shoes, the side cap, the utility belt, those short-sleeve arms, and the rubber band) all came in that color. Nevertheless, I think it’s a perfect, pure hue for an international soldier. That small gold collar she has on is a backwards Elves necklace. Named after a contestant on ABC’s The Bachelor (which I watch with my fiancée), Cpl. Wright has the most personality of the lot here, in my opinion. I love how the Hero Factory armor let me pose her arms splayed this way, as its pauldrons holds them in their sockets. The reason that these minifigs are Earth Defenders, and not the defenders of some other planet, is that glowing plant symbol on their chests… That leaf symbol reminded me of Eve’s plant sigil from Disney/Pixar’s Wall-E.
My concept here was to show a soldier of myriad campaigns, someone who had sustained quite a few injuries in his day. Sgt. Vasiliev sports futuristic prostheses on his right arm and leg, an eye patch, and some more recent bandages around his face. Ouch! This figure originally used LEGO’s specially-molded cybernetic leg, but I ended up giving that to the robot Bort-Bort from my previous figbarf instead. As homage, and tying these two together, Vasiliev’s synthetic leg is actually the companion to Bort-Bort’s regular one! I designed this LEGO Minifigure series (affectionately known as a “figbarf” among the fan community) for a figbarf contest. One of the categories was “Space,” and I wanted to do something a little different. I became enamored of the bold graphic language of retro science fiction and retrofuturism a few years ago; indeed, I first explored LEGO retro sci-fi with my series of “set-style” creations Body Battlers in 2017. Rather than making a series of Body Battlers figures here, though, I opted to create some characters that were a bit more universal in the ‘50s sci-fi space. • Bort-Bort, a deadpan robot. Devoid of emotion, cultural references, and understanding of human scansion, Bort-Bort frequently lets off one-liners which are unintentionally hilarious. Here, at last, was an excuse for me to use every possible robotic limb piece from LEGO! I enjoyed designing such a washed-out figure; I think it makes his “eye” scanner stand out even better. Originally, this figure also held a ray-gun, but I thought exposed claws seemed more fitting of a classic humanoid robot. • Lois Mills, a hapless All-American Girl. A neophyte to space exploration, Lois hopes—maybe in vain—that she can get back to Earth in time for her senior prom! Problematic and utterly sexist as the trope of the helpless “damsel in distress” is, it’s nevertheless a staple of the pulp sci-fi genre… As such, it felt accurate to include such a character here. Stay tuned for much more empowered women in upcoming works! I love the combination of dark azure and purple, so that’s another reason I’m glad I designed Lois. Interesting note: the head dome she wears is only 1/2 there, as her hairpiece is too large in back for the second piece to attach. • Chip Fleming, a dashing adventurer. Leader of a hundred space explorations, captain of his own rocket ship, and frequenter of dozens of worlds, Chip is a classic hero of ‘50s science fiction. Just as quintessential as the disempowered woman in this genre is the hyper-masculine, clean-cut, alien-blasting spaceman. I loved getting to use some of the blondest possible hair here for that perfect, matinée idol look. Like Lois, Chip only wears 1/2 of his helmet; although his hairpiece would have fit inside the full sphere, I wanted the two bubbles we see here to be of equivalent opacity. • Toscoob, a malevolent Martian. Emperor on his home planet, and renowned even there for his wickedness, Toscoob’s favorite delicacy is raygunned human! What more can you ask for than a villainous green Martian? This character was another clear trope to include in my retro space collection. The decorous military flairs, like the cape and epaulets, are actually inspired by the Looney Toons character Marvin the Martian. I appreciated getting to use a Harry Potter wand element in the enormous raygun, which itself has been borrowed and modified from Body Battlers Set 52015. Toscoob steals his name from Tolstoy’s Aelita, a famous work of Soviet sci-fi about an advanced Martian society. • Salno, an absentminded Venusian. Half the time, Salno even forgets her home planet—this is why she carries around a sonic resonator, which can capture and replay sounds to jog her memory (as well as blast aliens with sound waves!). Of the five characters on display here, Salno is the most out-of-left-field, not really having a clear precedent in retro sci-fi literature or film. Nevertheless, I think her aesthetic matches with the rest of the collection nicely. I built this fig around that gigantic pink afro; giving her short legs resulted in a hugely disproportionate body that I really liked. Originally, Salno was gonna have the hairpiece on backwards, resulting in a bulbous, textured head, but I so appreciated the expression of the minifig head I chose that I couldn’t resist showing it off. I also am proud of the combo of silvered 2x2 dish and silver-capped microphone on her sonic resonator. 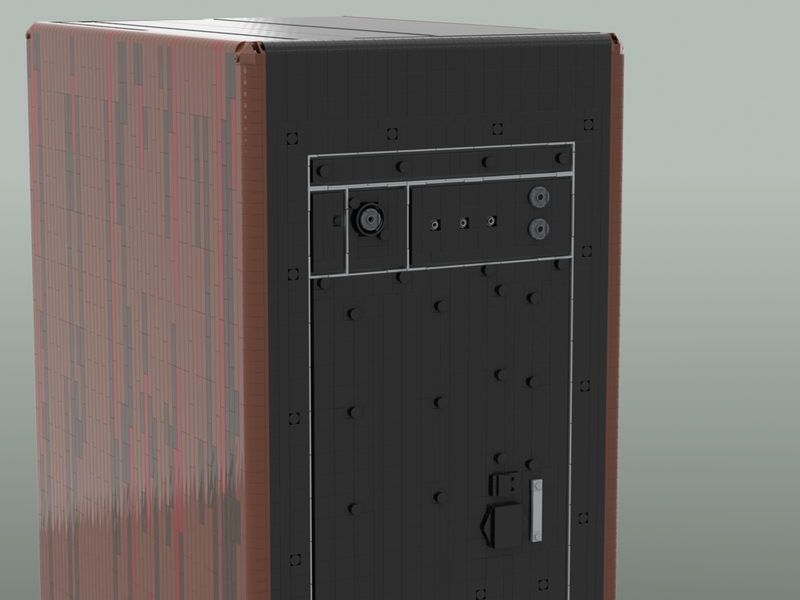 Above and at left: a render of my designs for life-size LEGO replicas of a Focal Trio11 BE speaker and a Zaor Isostand MkII. At right: those same designs, assembled and photographed nearly 3,000 miles (4800 km) away. It was an absolutely crazy process to go from the “blueprint” at left to the reality at the right, one that entailed nearly 24/7 down-to-the-wire construction, a few extra builders, custom brick engraving, implementation of metal support piping, and tons of permanence gluing. But I had very little to do with that hands-on portion of the process. My work, instead, entailed designing the blueprint: a nearly 18,000-piece, 4’ 10” (148cm) tall, 63.3-pound (28.67kg) showpiece… in a matter of days. Read on to find out more about this colossal project— its timeline, design process, and more— and to hear about my experience working on it! Final render of my 61-piece micro model of the Focal Trio11 speaker. I designed this pair of models under the umbrella of Cornerstone Brick Designs, my friend and colleague Bruce Heller’s bespoke LEGO-building company. On commission from an audio merchant, he and I collaborated to put together this enormous showpiece for their booth at The NAMM (North American Music Merchants) Show 2019 in Anaheim, CA. Bruce and I have been working together for more than a year, now. The first project Bruce brought me onboard for was an absolutely enormous 100,000+ brick, 17’ (5.18m) long replica of LA architect Dan Brunn’s Bridge House. During that process, we found that we were a great team, and I’ve assisted Bruce with a couple of commissions since. Back view of the micro-model, including simulated, branded brick engraving. While we displayed our Bridge House model at the 2018 Dwell on Design expo, Bruce and I first met our clients for the above-pictured speaker & stand models. We stayed in touch with these audio merchants after the expo, and eventually they came to us with an awesome idea: a life-size model of a new speaker, the Focal Trio11 BE, sitting atop a Zaor Isostand MkII stand… all built in LEGO. The client also wanted 100 micro-models of the Trio11 to use as giveaways for their prospective customers/employees. Bruce immediately called on me to handle the micro-model. My initial draft was a 95-brick model that was 4 studs wide, but this proved too expensive to produce at high quantity. Upon discovering as much, I designed a 3-stud wide, 61-piece version of the Trio11 instead. After a few tweaks by Bruce, we put this mini-design into production. As for the larger speaker, that also ended up falling onto my plate. Just a few weeks before the intended show date for the life-size models, Bruce—who was busy with another important client’s commission—handed off the larger builds of the project to me, too. I set to work designing them immediately. My finished designs for the Zaor Isostand MkII and the Focal Trio11 Speaker. The big constraint on this commission was timing. The turnaround was extremely tight; I began work at the beginning of January on models that would have to be show-ready for The NAMM Show by the 23rd of that month. That meant that I had to finish designing both models—completely, and in their final forms—early enough to give Bruce adequate time to order the requisite bricks and actually complete the models’ construction. That gave me a window of less than two weeks to get this all done. I spent hours and hours a day plugging away on the builds. Quite fortunately, the period when I needed to cram on this project coincided with a period of relative openness in my other commitments (an omen from the LEGO gods, perhaps). Nevertheless, spending so much time at my build table fatigued me, and I had to take occasional breaks to stop myself from burning out physically and mentally. I built using Bricklink’s digital design software, Stud.io. Aside from a few tricky spots I had to figure out “by hand” first (I’m usually a physical builder, and that’s how I’m accustomed to solving problems), I designed speaker and stand wholly on my computer. I worked digitally out of necessity. For a few reasons, a software build was my only viable option. First, since I had to transmit my designs over the Internet anyway (Bruce and the show were in California, and I in New Hampshire), it expediting sending my blueprints to the build site. Secondly, a digital designer is much quicker than working by hand, not least because it’s a matter of clicks to make modifications even at the deepest parts of the build, whereas on a physical build you might have to deconstruct huge areas to make minor adjustments. Thirdly, I didn’t even come close to having enough bricks to manifest my design in the real world myself! Let me also take a chance to say: I had never seen either Focal Trio11 or Zaor Isostand MkII in person when I designed their life-size LEGO counterparts. Luckily, Cornerstone Brick Designs’ client gave us plenty of images to work from, and spec sheets detailing measurements of various parts of the equipment we were to build. These served as invaluable resources to me as I figured out proportions, calculating from centimeters to studs and back again to keep all the sizes as accurate as I could within the LEGO medium. I designed the Zaor stand first, working my way from the bottom to the top. Since such a thin structure as the Isostand’s central column would be too flimsy to hold up a heavy brick-built speaker, Bruce and I knew that we’d have to include space for non-LEGO support structures. As such, I left cavities within the stand's column, inside each of its two “bases” (those puzzle-shaped pieces of wood on top and bottom) and through the quartet of isolators on its top. The structure of metal piping, plywood and stopgaps would remain Bruce’s domain, since it was he that would actually be working with the physical models. I could only do my best to give him as much space as possible to work with. Then came the Trio11 speaker itself. This model, which contained about twice as many parts as the stand and probably four times as many engineering challenges, took far longer to complete than the stand had. I designed the sides first, as these would set the size for the rest of the speaker. Next I fabricated the bottom section, which would serve as both an anchor and a central hub onto which the four faces of the speaker would be attached. I carefully designed this portion to have bar-shaped inner cavities, highly reinforced by Technic elements, which would perfectly sheath the support pipes which ascended through the stand. Back face, front face, inner core, and top of the speaker followed suit. Notably, Bruce had already thought through the large speaker dish, making a prototype from 3x12 Wedge Plates and Mixel joints. I was glad to make use of his prototype in my final design, and I conceived of a smaller version around the same principles for that little dish up top. Accommodating the curvatures of these two dishes, and masking the innards beneath them, was probably the greatest design challenge I faced while working on these models. After a little less than two weeks’ intense work, I finally finished my designs for both the Zaor Isostand MkII and the Focal Trio11. With relief, I sent the files off to Bruce and looked on with satisfaction as a few weeks later, my blueprints were realized in actual bricks and put on display for thousands of people at The NAMM Show 2019. The top of the Zaor stand is one of my favorite parts of the design. Here in the render, the thinnest part of the isolators are 2x2 round bricks; in the physical model, however, these bricks are no longer there. Instead, the metal piping shows through, running from the body of the stand and up into the speaker. The delicate 1x1 brick lines between the four isolators are the most fragile aspects of the whole model, so they were glued into place. Here’s a closer look at that large dish Bruce prototyped. To decorate it, I resorted to 1x1 curved corner tiles to solve the issue of rectilinear surfaces colliding at the dish’s edge. Although the beveled ring inside has its inevitable gaps, I was nevertheless quite happy with how the 2x4 brick with curved top satisfied a shape need I had. That slot in the bottom of the speaker is a signature feature of the Trio11, but one measurement our client failed to give me was its depth. I had to make assumptions here and do what looked right and would be stable. Evidently, the real thing goes almost as deep as the speaker itself! Here, to capture some delicate painted-on lines from images our client sent us, I used a technique I first pioneered with one of the builds in my Techno Satires series, “Fixing the Drain.” While I originally colored these lines in white, Bruce thought they looked too garish, and recommended instead that I make them light grey. I think he made the right call, here, since his chosen color made the lines look even more delicate. I loved designing this back face of the Trio11. It was maybe the most fun part for me to figure out! Emulating the circular seam that encircles both the top dish and a smaller monitor (that light grey bit with grille tiles on top) was a big challenge at this life-size scale. I ended up approximating the circle as best I could by using a few different varieties of wedge plates laid against each other. I also had to devise a more angular solution for those two oval-shaped holes on either side of the top circle, since LEGO has yet to produce an arch that has a 3-brick span. Thanks for reading! If you have any other questions or thoughts about these models, feel free to leave them in the comments below. As soon as I got my hands on LEGO set 70828 Pop-Up Party Bus, and its huge supply of bricks in coral, I knew I wanted to jump on using this new-for-2019 hue. The question then became: what would be a fitting employment of this bright, idiosyncratic new color? The first—somewhat absurd—idea that occurred to me, which I ended up running with, was building a pink salmon. After all, I’ve never built a fish before! A female Oncorhynchus gorbuscha, my primary picture reference when building. I had very little knowledge of fish (at least, not on a dinner plate) before going into this build. It turns out that “Pink Salmon,” scientifically known as Oncorhynchus gorbuscha, is actually a species of saltwater salmon native to the northern Pacific Ocean. The males develop a signature hump during mating season; for that reason, this species is also known colloquially as “humpback salmon” or “humpies.” I’ve opted to build a female of the species, since I preferred her streamlined shape. While coral was a given color choice, its companion hues took a little more figuring out to get exactly as I wanted them. I opted to go with olive green based largely on the image at right, and also because I thought something earthy would help to offset the brightness of the coral. From there it became a question of rendering a pseudo-gradient from olive green to coral and then to white for the underbelly. Pale pink and pastel green worked well as intermediaries. I turned to dark green out of necessity for the fins, as I didn’t have any wedge plates in olive green, but I like how the darker color looks here. The size and shape of my model came about primarily around my use of the 3x12 wedge slopes in olive green, which I immediately gravitated towards for the back part of the body. These large bricks demanded a Studs-Not-On-Top design; a 1-stud wide spine of support plates and SNOT bricks runs along the body of the whole salmon as a result. The huge wedges I used also gave me a very natural place to break for a point of articulation. I decided to give the salmon some mid-body flexion for a few reasons. Firstly, I tend to compulsively include posability in my builds, especially the creature ones; secondly, the fish didn’t look quite “alive” without a bit of a ripple running along its body; and thirdly, while I was building, I toyed with the idea of making my noble Oncorhynchus gorbuscha into one of those electronic singing fish. This was an impulse I only barely resisted! Parts of the build I like the best: the fins, which took some creativity to attach; the color balance I achieved; the way I did the fish’s eyes; and the way the body is shaped. I’m pretty pleased with this fun, casual little build that let me experiment with a new color! "The Tale of the Three Brothers" is my fifth ABS challenge build. This build, an artistic presentation of "The Tale of the Three Brothers" from Harry Potter and the Deathly Hallows, is the fifth build I've completed for my second round in the ABS Builder Challenge, an online competition where LEGO® artists are tasked with implementing a "seed part"—in this case, a silver goblet—creatively into as many builds as possible. In this particular model, some of these goblets become the Elder Wand. A linear stick with regular round bumps—the result of stacking the cups on top of one another—quickly became a large-scale Elder Wand to me. I opted to create "The Tale of the Three Brothers" over, say, a scene with Dumbledore or Voldemort using the wand for a few reasons: one, the gorgeous animated version from Harry Potter and the Deathly Hallows: Part 1 was too stunning a sequence not to try to pay homage to; two, I could easily imagine building a hand for Death at scale with the Elder Wand; and three, the necessary color of the wand—silver, because of the seed part—made me think, initially, to do a black and white color scheme, which felt like a flashback to me, hence "The Tale of the Three Brothers." Between the time I had the idea for the build and its final execution, I ditched a purely black and white concept in favor of grayscale plus a few muted colors. This change was precipitated by both not having any good vegetation parts in greys, and by my wanting to avoid having a grey background, which I felt would have robbed the final presentation of some of its panache. As such I opted to include the earthy, somewhat noxious-feeling combination of olive green and dark tan. Brown got its place out of necessity—I needed it for the bridge's hand rails—but I think it works with everything else so I don't mind it too much. For me, the real star of the show here is my skeletal version of Death. When I first envisioned the build, I actually imagined three separate vignettes, one for each brother, each with a pair of disembodied skeletal hands floating symbolically above them holding their particular Hallow. When I realized I could compress the vignettes into one, a full version of Death seemed appropriate. I had a blast designing Death's bony fingers, those two-boned forearms, and a hollow ribcage (hard to tell from this photo, but there are more ribs under the robes). Using BIONICLE capes for Death's mantle felt like an obvious way to create a more wraith-like, subtle, and lively (hah, hah) character; a happy coincidence was that I got to cover up most of Death's skull, which I was never too happy with since it came out blocky. Some after-effects, like the flaring wand-tips and glowing Resurrection Stones, felt earned on this build once I realized I wanted to demonstrate Ignotus' Invisibility Cloak in the way I did. This effect actually required shooting the build twice: once with Ignotus, and once without him. I then spliced the two together, selectively transparent-ified the Invisibility Cloak, and there you are!